This is kind of a joke, but not really. I had these pictures, sent to me after the death of my mother. 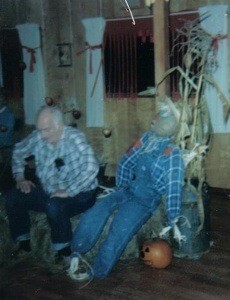 This one was of my dad, after putting together a scare crow, at the beginning of decorations for an autumn harvest party at their church. By the way, dad is on the left. He was always so busy, dug up his extra iris bulbs and other flowers to sell for their fund raising, and even in his later years tried to help whenever they needed it. Hope you enjoy the picture. I sure did. Looking at the photo is enjoyable. Made me SMILE. Hope you don't mind if I put it on Facebook. This is so sweet and adorable! Thank you so much for sharing with us!